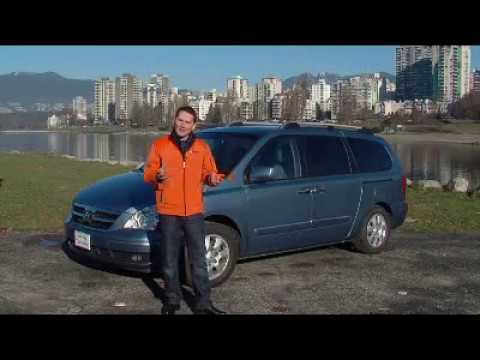 If you like to keep expenses down but don't want to sacrifice any helpful necessities, the 2008 Hyundai Entourage may be a good common-sense choice. Shoppers who demand abundant safety features should note that the Entourage contains six airbags, anti-lock brakes (ABS), a tire-pressure monitor and Electronic Stability Control, and has the same five-star crash-test rating earned by Kia's Sedona. Our Hyundai Entourage has been very reliable for us. We have done routine maintenance on time but have only had one issue in the 160,000+ miles we've put on it. The air fan module and compressor recently went out, but that's the only issue we've ever had!! We really like our minivan. It has been very reliable and a great fit for our family of 6. We recently had to replace the fan motor module and air conditioner compressor, but that is the only major repairs we've ever needed - routine maintenance not included (and we've put over 160,000 miles on it). It drives great, is comfortable and the kids love the DVD player! Entertainment while on long distance trips. As far as reliability it is top of the line for me. Have made a lot of cross country trips and it superior to any other big old that I have driven on long distance trips. It comfortably seats 7 people with heated front seats with dual temperature control. The vehicle has surround sound system, DVD player, 6 disc CD player. Love it's size and reliability however, the door handles come off easily. I really like the Hyundai entourage mostly because of its size its spacious it has up to 6 seats. Which makes it a perfect family vehicle. It also has seats that collapse into the car so there's no need for heavy lifting. As for dislikes i don't have one besides the car handles come off easily. Hyundai Motor America (Hyundai) is recalling certain model year 2007-2008 Entourage vehicles manufactured February 16, 2006, to June 30, 2008. In the affected vehicles, the secondary hood latch may corrode and bind and remain in the unlatched position when the hood is closed. Hyundai will notify all of the owners. For vehicles originally sold, or ever registered, in Alaska, Connecticut, Delaware, Illinois, Indiana, Iowa, Kansas, Kentucky, Maine, Maryland, Massachusetts, Michigan, Minnesota, Missouri, Nebraska, New Hampshire, New Jersey, New York, North Dakota, Ohio, Pennsylvania, Rhode Island, South Dakota, Utah, Vermont, West Virginia, Wisconsin, and the District of Columbia, dealers will replace the secondary latch. For vehicles in any other state, dealers will inspect and either lubricate or replace the secondary latch, as necessary, free of charge. Owners may contact Hyundai customer service at 1-800-633-5151. The recall began January 2017. Hyundai's number for this recall is 154. Hyundai America Technical Center, Inc. (Hyundai) is recalling certain model year 2007-2008 Hyundai Entourage vehicles manufactured from February 16, 2006, through June 30, 2008 and sold in, or currently registered in, Massachusetts, Maryland, Michigan, New Hampshire, New York, Pennsylvania, Vermont, Wisconsin, Connecticut, Delaware, Iowa, Illinois, Indiana, Maine, Minnesota, Missouri, New Jersey, Ohio, Rhode Island, West Virginia and the District of Columbia. In the affected vehicles, the front lower control arms may fracture due to corrosion resulting from exposure to road salt and water. A fractured control arm can result in the loss of control of the vehicle, increasing the risk of a crash. Hyundai will notify owners, and dealers will inspect the degree of corrosion of the front lower control arms, and will either rustproof or replace them, free of charge. The recall began on January 3, 2014. Owners may contact Hyundai at 1-800-633-5151 or by email at consumeraffairs@hmausa.com. Hyundai's recall number is 115.